When it comes to something as life threatening as drinking and driving, there’s never a reason to take a chance. That’s why it’s so great that devices like the BACtrack C6 Keychain Breathalyzer are so affordable these days. Instead of even considering getting behind the wheel when you’re not sure if you’re over the legal limit, just pull the C6 out of your pocket and you’ll know beyond a shadow of a doubt. It uses the same accurate tech used by law enforcement across the country, and it’s on sale right now on Amazon at a discount. PROFESSIONAL-GRADE ACCURACY – Powered by BACtrack’s patented BluFire Fuel Cell Sensor, the BACtrack C6 utilizes the same pro-grade technology trusted by hospitals, clinics, and even law enforcement. DUAL-MODE OPERATION – Choose “Standalone Mode” and your BAC results are delivered directly to a bright, easy-to-read OLED screen. Alternatively, choose “App Mode” and the BACtrack C6 wirelessly delivers your BAC results to your smartphone via Bluetooth. ZEROLINE TECHNOLOGY – With BACtrack’s innovative Zero Line technology, you’re in control of your night. After your BAC results are delivered, Zero Line estimates the time until your BAC is 0.00%, allowing you to quickly and easily know where you stand. 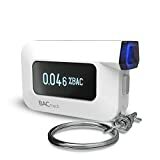 ULTRA-PORTABLE – The smallest pro-grade alcohol tester ever created, the BACtrack C6 is roughly the size of a 9V battery and weighs only 1.5oz. Attach it to your keys or put it in your pocket or purse and have it with you any time you drink!